NARRATIVE: On Tuesday, May 4th, 2010 at 10:38 P.M. units of the Spokane Fire Department responded on a fire reported at the Maplewood Gardens Nursing Home located at 1100 N. Superior. Initially, this call was received as an alarm system that had activated and then was shortly "upgraded" by the dispatch center to a full alarm after receiving additional calls reporting smoke on the 4th floor. The upgraded alarm brought additional fire companies to the scene. Fire crews first on the scene reported smoke coming from a 4th floor window and curling up towards the roof. A rapid entry was made into the building and interior search efforts were coordinated along with an aggressive fire attack using multiple crews to confine the fire and safely evacuate the tenants that remained inside the building. A tenant inside the apartment on fire was successfully rescued after being found on the floor by the crew of Ladder 1. After finding her, they were able to quickly remove her from her burning apartment unit. She was transported to a medical facility for an evaluation and was able to return to her home later in the evening. The sprinkler system had activated inside the apartment unit where the fire began and was responsible for assisting in keeping the fire small. As the fire suppression efforts were underway, there were 7 patients that were immediately identified and extra ambulances were ordered to help deal with the situation. Patient symptoms ranged from smoke inhalation to cold exposure. Two of these patients were transported to medical facilities. The fire was successfully knocked down and extinguished after 15 minutes. Station 1 from their neighborhood location of Riverside and Browne were the first crews to arrive. Their quick response, fast attack and search efforts supplemented by other neighboring crews were another key reason why this fire was kept small. A total of 30 firefighters on 5 engine companies, 3 ladder companies, a rescue unit and 2 battalion chiefs responded on this fire. The fire currently is under investigation by the Special Investigation Unit and remains undetermined at this time. Fire damage was confined to some of the apartment contents, a wall and carpeting. There was smoke damage to the apartment unit including some of the neighboring apartment units and some water damage to an apartment unit below. In this fire, the sprinkler system and alarm system both found to be operating in this complex, were important factors in allowing for early alerting and evacuation of the occupants, and quick suppression efforts on the fire. PROBABLE CAUSE: Undetermined at this time by the Spokane Fire Department Special Investigation Unit. DAMAGE EXTENT: Light fire damage to the apartment unit. Moderate fire damage to contents. Moderate smoke damage throughout complex wing and moderate water damage. NARRATIVE: On Wednesday, May 5, 2010 the Spokane Fire Department responded at approximately 11:45 PM to 4708 North Cook on a reported structure fire. The first crew on-scene reported heavy smoke and fire coming from a wood framed, 2-car garage. The fire was extinguished in approximately 30 minutes and there were no reported injuries to firefighters or civilians. PROBABLE CAUSE: The cause of the fire is under investigation by Spokane Fire Department's Special Investigation Unit, however the fire is listed as suspicious in nature due to its close proximity to a garage fire that happened approximately 90 minutes earlier within the same neighborhood. DAMAGE EXTENT: The garage and its contents were a total loss. NARRATIVE: On Wednesday, May 5, 2010 the Spokane Fire Department responded at approximately 11:24 PM to 4904 North Lee on a reported structure fire. The first crew on-scene reported heavy smoke and fire coming from a wood framed, single-car garage with the fire extending into a motor home parked in front of the garage. The fire was extinguished in approximately 15 minutes and there were no reported injuries to firefighters or civilians. DAMAGE EXTENT: The fire totaled the garage, a vehicle parked inside the garage and the motor home. NARRATIVE: On Saturday May 8, 2010 at 0:122 AM, 7 Companies of Spokane Firefighters, 4 Engines, 1 Heavy Rescue, 1 Pumper-Ladder and 1-Senior Ladder under the direction of Battalion Chiefs Steve Sabo, Dave Haworth and Larry Mummey responded to a reported building fire at 926 E 8th Avenue, HiFumi En Apartments. The apartment building is a HUD subsidized building specifically for disabled persons and seniors 62 years of age or older. The building housed 41 living units and was 99% occupied at the time of the fire. The first company arrived within 5-minutes and reported a two-story apartment building with smoke showing from the address side. The incident was upgraded to a working fire and companies went to work immediately upon arriving to search and rescue victims from both floors and confine the fire to the area of origin. Due to the high potential for multiple victims and difficulty rescuing non-ambulatory victims, a second alarm was struck at 0134. Additionally, a third alarm was struck at 0145 as well as a special alarm for 6 ambulances soon after. It took 52 Firefighters just 20 minutes to locate and knock down the fire. The entire building's occupants were evacuated and many of those had to be rescued by Ladder and Engine Companies. Firefighters were able to limit the fire's damage to the first floor common areas and the main hallway. Seven (7) occupants were treated and transported from the scene to local hospitals (one critical, two serious and four minor). Nearly all of the occupants received medical care on scene and varying levels of support from the SFD Firefighter/Paramedics until they could be moved to temporary accommodations. In cooperation with the Housing Authority, the SFD Command Team was able to place all of the occupants in a local hotel. The occupants were transported by an SIA Bus to the hotel and accounted for on arrival by facility staff members. The HiFumi En Apartments are not able to be reoccupied until significant repair can be performed and approved by the Fire Marshal and Building Department. PROBABLE CAUSE: Currently under investigation by the SFD SIU. DAMAGE EXTENT: Significant damage on the first floor in the common area and hallway. The building is not able to be reoccupied without significant repair. 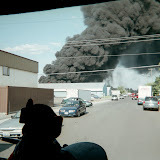 NARRATIVE: On May 3, at 1216 hours, the Spokane Fire Department responded 4 engines, 1 ladder, 1 rescue, and 2 battalion chiefs to a reported structure fire at 617 W Providence. First arriving companies reported light smoke throughout the residence with no obvious cause. After ensuring all residents were evacuated, companies began to search for the source of the smoke. The fire was eventually located in a crawlspace under the main floor laundry room. A small portion of the main floor had to be removed to expose and finally extinguish the fire. There were no injuries to civilians or firefighters. PROBABLE CAUSE: The fire was caused by lint buildup in a dryer vent hose. DAMAGE EXTENT: Damage was confined to the dryer and the structural members directly beneath the dryer with minimal smoke damage to the rest of the residence. NARRATIVE: This afternoon (May 2, 2010), the Spokane Fire Department responded at approximately 4:36 PM to 8821 North Hill N Dale street on a reported structure fire. The first crew on-scene reported fire showing on the exterior of the south side of the 3-story wood framed apartment building. Fire fighters aggressively attacked the fire that had started in a shrub near a main floor patio and extended up to the third floor and was spreading into the attic when it was extinguished. Additional fire crews completed ventilation and salvage and overhaul. The fire was brought under control within 20 minutes and there were no reported injuries to the occupants or firefighters. Six fire companies with 21 firefighters responded to this fire and were on scene for approximately 1.5 hours. PROBABLE CAUSE: The cause of the fire was determined to be children playing with matches. DAMAGE EXTENT: Fire damage was confined to the vinyl siding on the apartment building.